For Live tracking of the expedition, please scroll to the bottom of the page. With the recent underwater discoveries of Sir John Franklin’s two vessels, the Erebus and Terror, the mystery of what happened to Franklin and his team may be finally coming to a close. 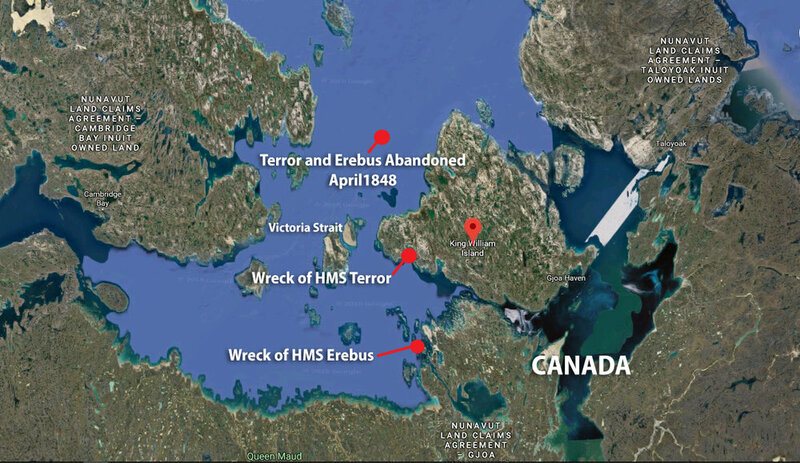 A team of 4 elite athlete-adventurers is traveling to King William Island in the Canadian Arctic on July 25th, 2018 to retrace the presumed route of Captain Sir John Franklin’s doomed crew. Starting at Cape Felix, located in the northwest corner of the Island, the team will attempt what has never been done before in a single season - to travel overland in the summer and without the assistance of motorized transportation to Terror Bay - a distance of well over 100 miles. Unlike teams of the past, this group will self-support using the innovative Monowalker trekking system, and unlike teams of the past, they will travel a short distance inland as opposed to along the coast - utilizing the glacial geology in hopes to find additional routes used by Franklin’s men as they explored the island. The team is also supported by Canadian satellite imaging company Urthecast - and will be using high-resolution satellite imagery captured specifically for this project to help identify areas of interest along the route. A big thank you to our sponsors/supporters who have helped to make this expedition possible: Merrell, Stoked Oats, Urthecast, Farm to Feet, Monowalker, First Air and The University of North Alabama. Map showing the location of the ship wrecks in relation to where they were known to be abandoned and King William Island where most of the crew artifacts have been found. Map showing past search areas for Franklin's ships as well as known artifact sties marked with an 'X'. The RED line indicates the general route that the Adventure Science team is planning to travel on foot during the In Franklin's Footsteps expedition. (July 25th, 2018) The Adventure Science team is on their way to King William Island! After a day spent staging/testing gear yesterday, the AS team flew out of Edmonton early this morning bound for Gjoa Haven, Nunavut, 250km north of the Arctic Circle. The team of four will make their final preparations this evening in Gjoa Haven and then will take a Twin Otter plane another 175km north to Cape Felix on the northern tip of King William Island where they will be dropped off and their self supported trek will begin! A big thank you to expedition sponsor First Air, Fly the Arctic for helping to get the guys and all their gear safely to Gjoa Haven! Evening Update: The team has arrived safely in Gjoa Haven and is making final preparations to depart for Cape Felix tomorrow! We tested the InReach live GPS tracking this evening and all seems to be working well. To see a map with the team's location as well as past track, please check the bottom of this page. The location and track should start updating tomorrow once they're on the ground in Cape felix. We made it to Gjoa Haven without any issue. Weather is cool and the wind was up at 30 km/h when we landed on the dirt runway just outside of town. We were picked up by our local outfitter Charlie Cahill and given a tour around Gjoa Haven before being delivered to the house we have rented for the evening. Gjoa Haven is a small hamlet of ~1700 people according to Charlie and there are a lot of kids. The airplane was full of families and many young babies. No pavement here - all roads are dirt and ATVs seem to be the vehicle of choice for everyone. Houses are on pilings in order to allow for water and sewage to be accessible and to deal with permafrost and ground movement. Apparently it’s arctic char fishing time and everyone is dipping a line down at the inlet where Amundsen famously anchored and overwintered 100+ years ago. Food and supplies are expensive and due to the prohibition of travelling with fuel, we weren’t able to source anything for our camp stoves and forced to buy refillable stoves up here - which was annoying and big expense. We are now just working on organizing the gear for tomorrow’s flight - where we will be dropped at Cape Felix on the northern end of the island. From there, it’s ~13 days to reach Terror Bay where we will be picked up. Everyone is tired I think - I know I am - but we are excited to get underway. We’ll check in tomorrow with the latest on the trip up to Cape Felix. (July 26th, 2018) The guys are finally on the ground and exploring the northern tip of King William Island. We received a brief Satellite call from Simon and everyone is happy and healthy! Their flight was delayed leaving Gjoa Haven so they weren't dropped off near Cape Felix until approximately 5pm. The guys wasted no time and headed out right away to explore the area. They headed north toward Cape Felix point, the northern point of King William Island. They have already located the Trafton Summer camp at Cape Felix which was one of the most heavily used ares by the crews of the Erebus and Terror. It sounds like things are off to a great start. Temperatures today were quite cold but the forecast is for slightly warmer temperatures in a few days. Simon said that one benefit of the cold is that so far the bugs haven't been too bad! Currently they're making their way back south from Cape Felix, they were still on the move when I talked to Simon and sounds like they'll be taking advantage of the midnight sun and pusing on late into the evening. Great start to the expedition! (July 27th, 2018) Just spoke with Simon and all went well today. They covered another 25-26kms, this time south to Cape Maria Louisa. The weather was challenging with rain, sleet and snow on and off all day but spirits are still good and everyone is happy and healthy. They came across some cool finds today on their journey but nothing Franklin related. They're back at the camp now and got back just in time to beat the rain. If anyone is having trouble seeing the live tracking, we have been told that the Garmin tracking isn't supported by all web browsers. On a PC, Firefox and Internet Explorer should work, however there are issues with Google Chrome. Sounds like tracking isn't supported on most mobile devices either. Not sure about browser support for Mac computers. Hope that helps! (July 28th, 2018) Just spoke with Simon and all is going well. The team is in good spirits after their first warm meal in 24hrs. The weather has been a real challenge for the team with snow, rain, and high winds. They had to wait out the weather this morning, then broke down the camp and moved south about 20kms. They found an interesting rock cairn today, it was marked with the year 1992 and the initials RN. Royal Navy perhaps? Tomorrow they hope to travel to Hill 222, which is one of the sites they were most interested in based on satellite imagery. Will be a big day if they can make it there. Not much else to report. Forecast looks like weather should improve by Tuesday but it will be another few windy cold days ahead. Seems like the precip should ease off though. (July 29th, 2018) Talked with the team and all is good. Their food supply is holding up well and the Monowalkers are working well! Hill 222 was a disappointment today, there were no signs of Franklin artifacts. The carin/object that could be seen in sat images was just a large rock. The only thing of note was that there was a large 'X' near hill 222 that is known about and was left by the army. Good news is that the weather was relatively dry today but still cold and windy. Tomorrow should see slightly warmer temps and a bit more sun with wind tapering off in the evening, which I'm sure will be a welcome change! They have just set up camp and will be making a short trip to Victory Point this evening before heading to bed. Apologies for the lack of tracking online, it seems that the tracking site is not working properly and locations are not being recorded as they should. We will contact Garmin tomorrow to see if there's any way to resolve this. (July 30th, 2018) Just talked with the team and they're out enjoying some very welcome sunshine! Their day has been good. They had a big day yesterday traveling almost 40kms and not finishing until 12:30am, but are putting in another big day today trekking south to the terminus of Collinson Inlet. They're roughly an hour away and will push on tonight to make it there to set up camp. The sun has allowed them to charge up all their electronics and I'm sure recharge a bit themselves. They saw lots of wildlife today, Muskox, Caribou, Arctic Fox and flocks of birds but no new artifact sites. Everyone is doing well, healthy and happy! (July 31st, 2018) Just talked with the team and they're just setting camp now. Another big day today with really challenging terrain and a rainy start to the day. Lots of lakes to navigate around and 3 river crossings. They did make a cool find late today, they found a very old stone cairn and remains of a wind break wall. The cairn would have been about 6-8 feet high but it is fallen over. An encouraging end to the day today! All is well with the team, a storm looks to be closing in on them for tomorrow morning but the good news is that it should be short-lived, and Thursday is looking to be a clear sunny day! (August 1st, 2018) Just talked to Simon, today was a big day for the team!! As mentioned, late yesterday they discovered a large cairn on a ridge top near where they were camped, about 2km inland from Two Grave Bay. This morning, despite rain and high winds, they returned to the ridge to take another look at the cairn and then proceeded NNW to check out the surroundings. Randall Osczevski advised that most likely that this cairn was one that was built by Schwatka to mark the second of the two graves where they had buried a member of the Franklin Expedition in 1879. Sure enough, only a few kms away they discovered a prominent grave which is possibly an unknown grave and possibly the grave documented by Schwatka. Upon a further search of the area, the team came across several other grave like features of varying types from coffin-like graves to two stone slab grave like features. Some of these may be Inuit graves. The team also found a soapstone bowl near the graves as well as a few other bowls in the area. A number of additional cairns were identified in the area as well. One grave-like feature was quite prominent with a number of large 4' slabs of rock laid in a line from the grave feature. They noted that this site can't be seen from the water which is why it may not have been discovered until now but this is speculation at this point, more research will need to be done to determine if this is indeed a newly discovered site. The team doesn't have an excavation permit so no further analysis could be done of the sites at this time other than taking photos and documenting the location. Despite a bad day of weather, the team is energized and spirits are high! They have about another 7km to travel tonight but are feeling good. If they make it to their intended camp location tonight, they will be roughly two days ahead of schedule so will have plenty of time to search additional areas. The weather is looking up with a small high pressure system moving in, bringing clear skies and sun. The guys say hi to all of their friends and family! Hopefully more details to come soon on today's discoveries, we'll be sure to keep you posted. (August 2nd, 2018) Hello everyone, just talked to the team. Today was a nice sunny day with light winds. They have their camp set for the night and say that it's their nicest yet, high on a soft gravel beach ridge. They took it a little easier today to recover and enjoy the sun, dry out gear, etc. Tomorrow is looking to be another clear sunny day which is definitely much deserved after all of the miserable weather they have had. The team has covered a lot of ground quite quickly, well over 100miles already. They're well ahead of schedule so will complete some extra search routes as they go each day. We're still trying to confirm details about yesterday's finds. The grave-like site seems to be the same site recorded by Tom Gross in 2017 however it seems that the coordinates don't line up, trying to figure that out now but it's likely that it's the same site. The large cairn-like feature however doesn't seem to have been documented. Still trying to confirm this for certain as well. The team also checked out a feature today that looked like it could be a boat from satellite imagery but nothing of note was found. Tomorrow the team is permitted to travel to a known site where life boats and bodies of crewmen were found by early search expeditions. Their plan is to search the area for any possible new artifacts. Sounds like spirits are still high and everyone is holding up well! (August 3rd, 2018) Talked to the guys this evening, they set camp early then did a 6km evening trek. Today is a first time in a while that they were settled into camp before midnight. They are at a place called Little Point Channel, they're way ahead of schedule and only 25-30km from their pickup point which is scheduled for four days from now. Lots of time to explore on the way! Today they visited some permitted known archeological sites with old life boats from the Franklin crews. They also found what appears to be a very old Humerus bone on its own, not sure as to how it ended up where it did. Otherwise the day was sunny and clear, tomorrow could bring some rain and clouds but the team definitely got a nice break from the dampness for a few days. (August 4th, 2018) Good news form the field! Just talked to the team and they have made it to Terror Bay which was their goal and is where their pickup will be. They had a big push today and covered 25-30km. They said that they came across a lot of interesting cairns and other old tent rings, etc. Clearly an area that was well traveled at some point, either by Inuit, Franklin's men, or both. The team is now a complete two days ahead of their planned schedule and will spend the next two days checking out the area of Terror Bay before their pickup arrives by boat for transport back to Gjoa Haven. All is good and everyone is still doing well. Today was a bit of a damp windy day but things should improve again over the next few days. (August 5th, 2018) Talked to the guys, they had an easy day today exploring the Terror Bay area. They are camped near an old hut that is apparently known as Patsy Klengenberg's post. Apparently it's quite an interesting old shelter. They'll spend one more day trekking around the Terror Bay area tomorrow then weather permitting, will meet a boatman tomorrow evening that will take them back to Gjoa Haven on Tuesday. Sounds like it has been an incredible journey, will be awesome to hear more detailed accounts of their trip and see photos as well! (August 6th, 2018) The team decided to make an early departure from Terror Bay and are now on their way back to Gjoa Haven! Their boat transport was supposed to be tomorrow morning however the boatman arrived early and was getting anxious about a good weather window so they decided to take advantage of today's good conditions and make their way back by boat. The team should be back to Gjoa sometime early this evening. It's a bit of an early end to the expedition but will be great to hear about the trek and see photos from their journey. We'll send out a final update once the team has arrived safely back in Gjoa Haven tonight. Evening Update: That's a wrap! The team arrived back to Gjoa Haven by boat this evening. The guys are really looking forward to a shower, a good bed and a good meal! They didn't seem too disappointed to be returning a day earlier than expected. It will be awesome to hear of their adventures and see all of their photos. We'll be sharing many more details from the trek through our social media so please follow us and check in regularly for more on the In Franklin's Footsteps expedition! Thanks for following the expedition! 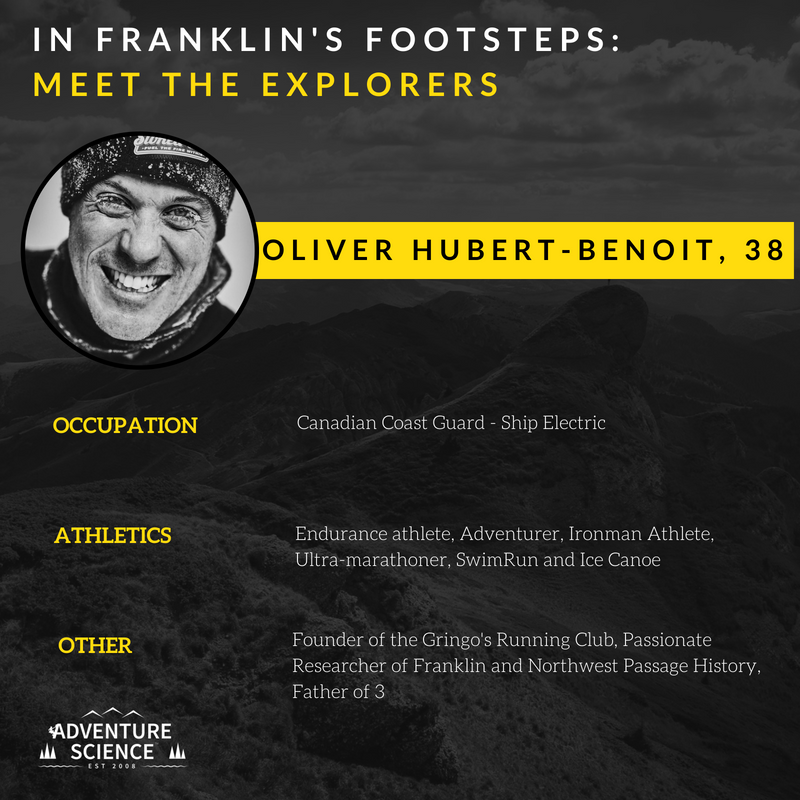 Check back often for news on other exciting Adventure Science expeditions.